Samsung's Galaxy Tab 7.7 was banned in Europe by the Duesseldorf Higher Court on Tuesday because it found the tablet infringes on Apple's design rights and looks too much like the iPad. The appeals court also ruled that the altered Galaxy Tab 10.1N, does not infringe on Apple's designs, and will be allowed to be sold in Germany. The Galaxy Tab 7.7 infringed on Apple's community designs, unitary industrial design rights that protect the intellectual property of products sold in the European Union, the court said in a press release. Parent company Samsung Korea is not allowed to distribute the Tab 7.7 in the European Union, except in Germany, the court added. Germany was not included in the ban in the E.U. 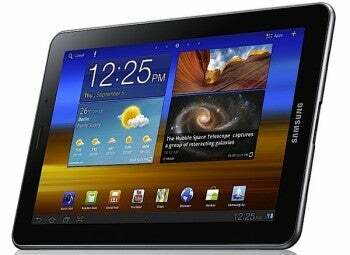 on Tuesday, because the distribution of the Galaxy Tab 7.7 was already banned in Germany by the lower regional court of Dû³¥¬¤orf in October 2011, when it ruled that Samsung's German subsidiary infringed on Apple's design rights, the court said. However, the lower regional court rejected an Europe-wide ban at the time because it said Samsung Germany and Samsung Korea were two separate entities. The German subsidiary was legally independent from parent company Samsung Korea and both companies are not the same when it comes to the design regulations, the court said. The appeals court however decided on Tuesday that the German subsidiary is a branch of the parent company and acted on its behalf, and that is why Samsung Korea was also banned from selling the Tab 7.7 in Europe, the court said. The back side and edges of the Galaxy Tab 7.7 in particular resemble the iPad in an unacceptable way, the court said. 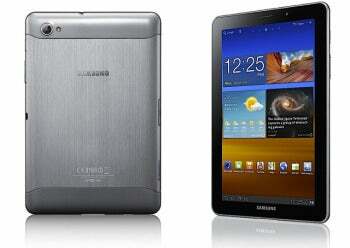 The court also ruled in another proceeding between Apple and Samsung on Tuesday concerning the Galaxy Tab 10.1N. The 10.1N is an adjusted version of the Galaxy Tab 10.1, that was banned in Germany along with the Galaxy Tab 8.9 by the higher regional court of Dû³¥¬¤orf in January. The higher court ruled on Tuesday that the 10.1N is sufficiently adjusted and does not infringe on Apple's community designs. The court thereby confirmed the decision of the lower regional court of Dû³¥¬¤orf made earlier this year and declared that the Galaxy Tab 10.1N can legally be traded in Germany. Both rulings are final, the court said. Apple did not immediately comment on Tuesdays ruling. Samsung said it was disappointed with the court's ruling on the Galaxy Tab 7.7, and would take all available measures to ensure the product is available in Europe. The company welcomed the ruling on the Galaxy Tab 10.1N and added that "should Apple continue to make legal claims based on such a generic design patent, design innovation and progress in the industry could be restricted." At the beginning of July, a U.K. judge reached a completely opposite conclusion from his German colleagues. He ruled that Samsung tablets do not infringe on a registered Apple design because "they are not as cool" and the Galaxy Tablets "do not have the same understated and extreme simplicity which is possessed by the Apple design." The decision of the higher court of Dû³¥¬¤orf will impact all markets across the E.U. according to a statement from Samsung. The U.K. is also a member of the E.U.